The lovely and talented Adrienne Palmer from Susan Palmer Designs in Honolulu sent me a photo yesterday in the hopes of getting a rise out of me. It worked. Wow. Here it is. I'll ask you what she asked me: how does something like this make it into production? This faucet's made by a big player in the world of specialty faucets and these things don't come cheap. But really, who gets an idea at a brainstorming meeting and shouts, "That's it! We need a dragon tub filler! It's perfect!" Then somebody else agrees with the original guy who thought it was a good idea. So much so that the dragon gets designed and produced. Then it shows up in a showroom and somebody buys it. Who are these people? I've hauled my share of existing swan faucets and tub fillers out of homes I've renovated. Somebody thought they were pretty once. Chances are though, she thought that in about 1968 and her house is being renovated because she's dead and her kids sold the house to somebody who hired me to de-old lady-fy it. Can I say that? 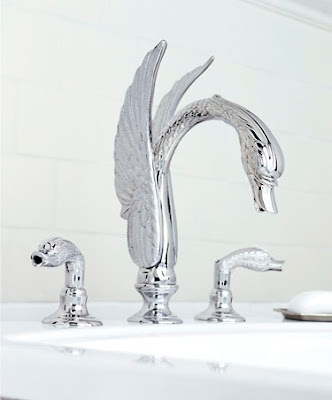 Let me tell you, it's a very special kind of a person who buys a gold, swan-shaped faucet. Believe it or not, I once talked someone out of buying a dolphin-shaped tub filler like this one. But a dragon? Honestly, I wouldn't know how to react if a client introduced that thing as an idea. Well, I suppose that there's something out there for everyone. But I'd rather not know about some of that stuff. OK, that is just ugly and bordering on creepy!! But I'm sure there are people out there who think it's the greatest faucet ever and would pay an outrageous price to have it in their bathroom. 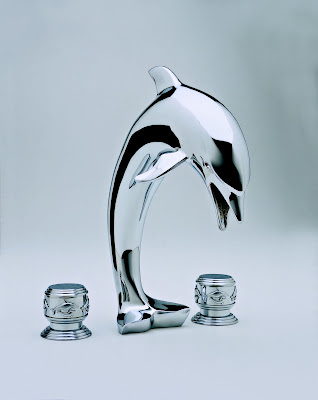 I'm going to totally set myself up to be made fun of here, but I think the dolphin faucet is cute :-) Although not so sure it would still be cute with water shooting out of its mouth!! Thanks for your comment on my post about Doug Meyer's home. That's totally the kind of feedback I was hoping for -- honest and insightful. As you may have noticed, I didn't express my own opinion on his house.... didn't want to sway anyone's opinions :-) As I read through the article, I went from thinking it was totally crazy and over the top, to really liking certain things about it. HATE the magazine page collage and the gold hassocks and the DR chairs, but love the colours that he's used. Especially the purple in the Florida room. Also love the turquoise deck, but not the furniture on it. The cactus planter is also nice, but looks a bit out of place. And the zebrawood is cool. And NO, I don't hate you!!! Whew! I'm glad to know you don't hate me Kelly :). I have a problem with the dolphin this because they are such a cliche here. It's hard to get near a body of water in this part of the world and NOT see them, so I don't understand why anyone would want a dolphin motif in their home. I mean, all you have to do is walk to the beach and see the real thing. You know? 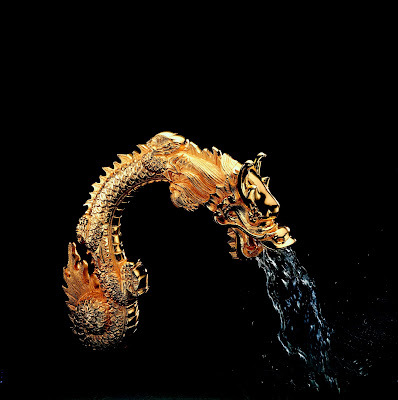 Actually, I would think a segment of the nouveau-riche Chinese market would be influenced by the dragon faucet. Lucky dragon in the house! (but better not drip: it's bad Fung Shui! (designer): *sarcastically* What, like a giant dragon head that spews water? And I suppose we should make it gold too, huh? I didn't identify Altmans on purpose in that post Adrienne. I didn't want to hear any grief when they got a Google Alert later today. But now the cat's out of the bag. Well, if I'm going down man, I'm taking you with me. I love the scene you painted there. I'll bet Bob the Bossman played a lot of D&D when her was a young teen. We're thinking about taking our little schtick on the road. Hey, that dragon could have been detailed with red enamel. It could be A LOT worse! Good point. Red enamel would be a lot worse. How about red enamel AND make it a steam generator so that it would appear to breath smoke! This is when one learns how to maintain a poker face. Talk about de-old-ladying a space. Here is one for the books: my sales rep once walked into a phallic themed bathroom, wallpaper, art, statues. ah-hem, thank god there wasn't a, em, a phallic faucet. He was there to inspect a defective dolphin faucet for warranty. That's a really good point Laurie. I learned a ling time ago never to react spontaneously in front of a client. Most people are looking for agreement when they ask for an opinion anyhow. This blog functions like a relief valve for in a lot of ways. I have a tendency not to mince words, but still, I never actively crush people the way I tend to when I write things here. Wirh that said, curbing my outspoken nature would have been a real challenge in the presence of a phallic bathroom. I'm not liking any of those... I guess I'm a boring girl! All it means Fifi is that you have good taste! BTW, do you know who makes that faucet? Actually, it's as hideous as the dragon.